This is another pic of Smokey. He is about 4 months old in this picture and he is a great addition to our family. He is so protective of my kids and yes…. He loves the snow! Have fun with him and keep the pictures coming in. Good luck with your handsome black GSD. Your Black German Shepherd is beautiful. 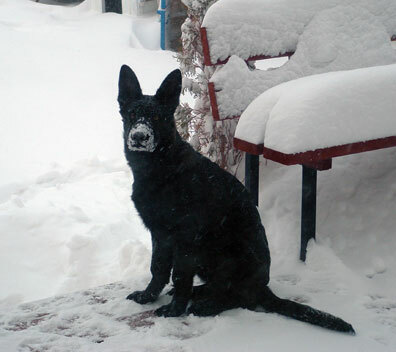 I had a retired Police K-9 Black Shepherd Jerry Lee He was awesome! Jerry Lee loved the snow and riding snowmobiles! Have fun with him and enjoy every minute. What a Beautiful Black German Shepherd! He looks like he is having the time of his life in the snow. Take care of your boy and he will protect you!! !